The WOODPECKER is a professional, non-destructive tool for testing the integrity of wood. After the striker pin is propelled into the wood it gives the depth of penetration in millimeters, and this is also shown on the display. Measurements can be compared with any protocol reference tables, in order to give an insight upon the density and quality of the wood. 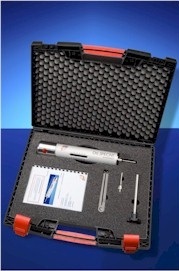 •	.. is a professional, non-destructive tool for testing wood. •	.. provides an easy way to measure the integrity of wood (specified in millimeters that the striker pin has invaded the wood). •	.. gives an indication of the density, quality and load bearing capacity of the wood. •	.. can test foundation piles, bridges, railways, utility poles, wooden playground/climbing equipment, etc. •	.. gives the depth of penetration in millimetres, and this is also shown on the display. •	.. is used by injecting a spring-loaded steel striker pin in the wood. •	.. can test e.g. foundation piles, bridges, railways, utility poles and wooden playground/ climbing equipment. Application areas also include tree farming and forest management. •	.. is optimized against water, humidity, soil, and dirt. •	.. is provided with a wear indicator which reminds of replacing the striker pin in time.